You might think it’s OK to pee in your inflatable hot tub. Just this once. After all, whose going to know? And surely the chemicals in the water are going to get rid of it, aren’t they? Well no. Not only is it gross to pee in your inflatable spa, it can actually be very dangerous. So please read on to find out why you mustn’t pee in your inflatable hot tub, my friend. Everybody knows you mustn’t do it, but still so many of us do. However there are several important reasons why you shouldn’t ever use your inflatable hot tub as a toilet! Whether it’s your inflatable hot tub or a friend’s, as you’ll read in a moment peeing in a hot tub means that someone is going to have to spend a lot of time cleaning the hot tub to get rid of the pee you leave behind. So when you have that secret tinkle, you’re creating unnecessary work. Sometimes, a lot of work! While you may think peeing in the hot tub is harmless, it can actually be hazardous to both you and other hot tub users alike. That’s all due to one of the main chemicals found in pee, called urea, This is a nitrogen-containing substance. It’s colorless and odorless, and it’s highly soluble in water. On its own, it’s pretty much non-toxic. In fact, when you add it to water, it is neither acidic nor alkaline. However! When you combine it with chlorine – remember that chlorine is the sanitizer used in most inflatable hot tubs tubs – the chlorine breaks down the urea. A new chemical by-product is then formed called chloramine. Now chloramine can be harmful if it comes into contact with skin in the water. In the majority of cases, the symptoms of exposure to chloramine are mild but still worrying! They including irritated and red skin, as well as burning and itchy eyes. And if you have a skin condition, then exposure can make your condition much worse. More seriously, if you inhale chloramine by breathing in the steam off your inflatable hot tub, it can cause respiratory problems such as coughing, wheezing, and sore throats. It can even cause asthma. You may or may not know this, but many competitive swimmers suffer from asthma. And a recent survey found that every competitive swimmer confesses to peeing in the swimming pool on a regular basis! And, as you’re aware, swimming pools contain a lot of chlorine. So now you know why so many of these swimmers have asthmatic attacks. We don’t want to keep on worrying you, but another health hazard is that if you breathe in chloramine on a regular basis, it can increase sensitivity to different forms of bacteria and fungi. These can lead to some very scary illnesses indeed, such as Legionnaires Disease. 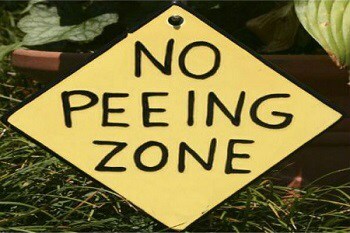 So the next time you think that one secret little pee won’t do any harm, think again! As with many things in life, prevention is better than any cure. There are two relatively simple ways to prevent people peeing in your spa. Make sure that everyone who uses your inflatable hot tub knows they must not pee in the water. Explain to them what happens and what health hazards one simple tinkle can cause. If you have children who are going to use your hot tub, it’s vital that you explain carefully to them why they must never pee in the water. Stress that they must go to the bathroom before they get into the hot tub. 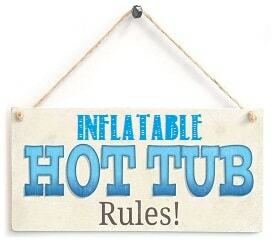 One useful way to reinforce this rule is to get the children to come up with and design a set of Inflatable Hot Tub Rules which you display near the hot tub. Having them do this helps them remember the rules – and stick to them. If you’re unsure about any area of children using your inflatable hot tub, we have an important guide which we think everyone who owns an inflatable hot tub should read: How To Keep Children Safe In Your Inflatable Hot Tub. Not to be too graphic, but there can be traces of urea on your body – even the cleanest person will most likely have a trace. That’s because apart from the obvious area, urea is also found in sweat. So if you have sweated at all during the day, then there will be some urea left on your skin. This will quickly wash off in the water. Therefore, before you and any other hot tub user gets into the spa, it’s imperative to take a shower. Don’t let anyone think just quickly dipping their head under the spray is enough! Make sure they have a good, all-over shower (with no soap or shower gel) before they use the hot tub. Showering also removes any shampoo residue, perfume, lotions, and oils on your skin that would also pollute the hot tub water. So showering is a win-win benefit all round, in terms of keeping your hot tub water fresh and clean for longer. If you believe that someone has peed in your inflatable hot tub, I’m afraid you’re going to have to spend a fair while putting it right. This is to get rid of the urea and to make sure the hot tub is safe for you and any other hot tub users. If you suspect there is pee in the water, you are going to have to shock the water in order to oxidize the urine and remove it from the hot tub. Remember, when you shock your hot tub, you will need to wait until the chlorine levels drop before you can use it again. If you are unsure about how to shock your hot tub, we have a step-by-step guide written in easy-to-understand language: How To Shock Your Inflatable Hot Tub (opens in a new tab). If you find that the water still smells unusually strong of chlorine after you shock the hot tub, then it’s highly likely some traces of urea remain on the vinyl surface of the hot tub. In that case, there’s nothing else you can do except completely drain your hot tub and clean it thoroughly. You’ll have to remove all of the contaminated water from the tub, and then when it’s empty give the sides of the hot tub a good cleaning. This will take time – and, to be honest, is a pain in the you-know-where. But you really must remove all traces of urea from the hot tub. So as you can see, peeing in an inflatable hot tub is not an innocent act at all. It can cause some serious health risks. It will also create a lot of work, and take you a lot of time to restore your hot tub to its pre-pee state. We sincerely hope this is something you never have to deal with! Thanks for reading.